"A room of your dreams"
As one of the few wood-manufacturing companies, the Coesfeld supplier has grasped how to make the name Parador well-known to end consumers as well. The synthesis of a full range provider of wood and derived timber products and a solid backed up marketing takes place in a plant area of around 180,000 m². 625 employees play their part in the market success of the products. The ideas for marketing and advertising the quality products are developed in a marketing centre covering 3,500 m². With a complete service in the product assortment areas of floors, ceiling and light the German company Parador is also on a winning course in the . . . market. Whether it be wood flooring, wall panelling or skirting edging, everything is based on the same high quality standards. Furthermore, customer orientation and the right instinct for changes plays an important role in the eyes of the brand supplier. Thus, the image of the Parador brand is characterised in all product areas by uncompromising quality awareness, creative product design and consistent marketing. The company is one of the few industrial manufacturers that not only fill goods warehouses, but also actively support marketing. Thus the specialised trade has got a complete marketing service at its disposal. This includes brochures, instruction manuals, the advisory handbook on floors, advertising presentations and much more. With Parador you are standing firmly with both feet on a high quality floor. The prefabricated Bellano-Click parquet flooring is especially designed for discerning customers that love and appreciate wood in their living environment. Handpicked high-class wood makes every Bellano parquet floor a valuable contribution to your home. A polished laminate range rounds off the Parador flooring range. HPL (high pressure laminate) stands for the highest level of quality for laminate floors. High manufacturing competence ensures a first-class décor image, e.g. 3-joint maple strip flooring (imitation wood). The Parador floor competence centre follows the idea of a "shop in shop" system and represents an individual space-saving display unit, namely 25 m² provides ample space to display around 150 sample areas. Framed by aluminium and beech multiplex, revolving triangular pillars, excerpt panels and fold-up displays appear in an attractive light. The individual sample area has a generous format, so that a good impression of the presented surface can be gained. The size of the individual sample areas guarantees a firm impression of the presented surfaces. The numerous types of wood can demonstrate their highly personal optical character. The floor competence centre represents a complete floor shop, which actively promotes selling and can be individually deployed in the exhibition and in the specialised discount store. At the shop centre an installation demo table is positioned. Assembly procedures and maintenance processes can be demonstrated on it. The table is designed so that, where necessary, computer hardware for a multimedia presentation can be installed. Parador focuses its main attention on creating an attractive basis for sophisticated living with wood, namely the floor. With the new floor programme the company offers the market a complete range to suit every taste and every purse. Prefabricated click parquet are just as much a part of the range as veneer and cork parquet; the laminate flooring and all-round accessories round off the programme. The prefabricated "Bellano-Click" parquet is designed for discerning customers, who love and appreciate wood in their living environment. The terms "select", "natural" and "living" describe quality assortments ranging from select and harmonious optical effects to vivid effects. Two different surfaces Parador AtmoPor (active breathing oil impregnation) as well as Parador ProGuard (easy care varnish seal) fulfil the different use requirements. "Portino", the cork parquet rounds off the parquet area. 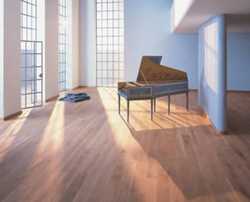 This flooring represents a "natural" alternative in living spaces that are subject to normal or extreme use. The product line "Furnova", the Parador veneer parquet with the innovative click mechanism – the Furnova boards are fitted together by simple pushing– serves the low-priced market segment, without sacrificing high quality requirements in the process. By means of a low constructional height of only 8 mm and fast, simple installation, this flooring is especially suitable for redecorating. The high quality real wood veneer retains the appearance and suggestion of real wood. With this flooring range, Parador covers the flooring sector with an unparalleled variety. Furthermore, the programme is supplemented by a corresponding communication method, all-round marketing aids, e.g. the floor competence centre and a complete accessory programme. The high quality product from the laminate floor range, "Clever Click" is easy to lay, leaves no traces and is easy to take out again. It is available in various attractive wood décors and one décor colour and achieves the quality that can be expected of a sophisticated laminate floor tested according to prEN 13329 for an intensively used living space. "Clever Click" stands out, above all, due to its low price. An innovative installation technique ensures that there is no necessity for adhesive. The elements of this "Clever Click system" are fitted together by means of a special nut and spring form. Meticulous selection of raw materials and expert manufacturing are the basis for first-class products. Wood is a natural product with its own character. Colour nuances and grains are characterised by the natural growth of the tree trunk and look different according to each piece of wood. The most exquisite veneers are sought out for the Parador real wood panelling. Experiences specialists guarantee the high quality Parador brand quality through a worldwide selection of the noblest veneers. Each individual veneer leaf is handpicked and meticulously examined – only particularly fine "fillet pieces" are used for further production. The veneer qualities are divided into three assortments, referred to as "exclusive", "harmony" and "nature". it takes the customers wishes seriously and therefore create an extension of one´s own self – sensual, individual and contemporary. Creative product design and marketing that promises what it preaches. Parador sees itself as an internationally active company, which responds to changing market patterns and increasing competitive pressure with an innovative and up-to-date marketing concept, which focuses on the development of comprehensive solutions for the interior finishing segment.